William Rippin - Inn Keeper 1848 Newspaper cutting regarding fire. (EW) mother's father kept the Commercial Inn, in West Street, it was next to the Brewery. He was also a mason. 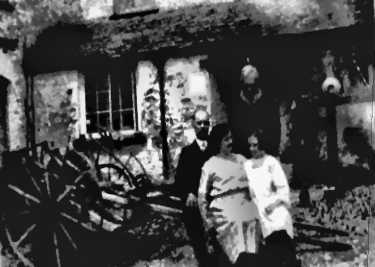 The Commercial Inn was home for the horse-drawn mail cart which took the post to Morchard Road Station, Morchard Bishop was the postal district for Witheridge then, the mail cart was a 'square red box' and the driver sat on top to drive the horse. On Wednesday morning, the 11th May 1848, between 11 and 12 o'clock, an alarm of fire was given at the Commercial Inn, occupied by Mr Rippin. The house being old and of a rather fragile kind and the thatch dry, it was with great difficulty that the thatch could be kept from communicating to that of the adjoining house in the occupation of T J Coater Esq., and had it done, so much more of the village would have been burnt. There was a most ample supply of water and through the exertions of those who helped, and we must not forget the most praiseworthy conduct of the women, who are always most active on these occasions, the flames were got under. The Inn, we hear, is the property of the Feoffees of the Crediton Grammar School and is insured. Rippin is not insured.